One of the first blog posts I ever wrote, way back in 2008, was about chili. In a cozy corner of my 4th floor walk-up, I had hatched the idea to challenge my friend Keith to a chili cook-off. No doubt wine or beer was involved, which had made both of us extra braggadocious. And as a result, two weeks later, 40 of our closest friends and allies crammed their way into said 4th floor walkup to sample two dueling chilis. We each presented our pots, and right away, a subtle gasp erupted from Keith’s corner. Those with a male genitalia looked at each other in horror, and whispered in full outdoor voices: “a vegetarian chili?!! No she didn’t…”Yes. I. Did. The underdog victory that followed seemed nothing short of miraculous. Keith did not demand a recount. After tasting the deliciousness of my southwestern veggie chili, he backed off his claims that the illegal Mexican immigrants hiding in my refrigerator were responsible for the popular vote win. And the evening remains one of my favorite friend and food memories to date. (As is the rematch). 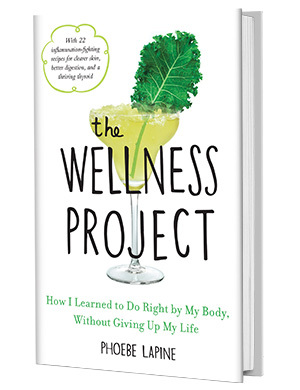 When my restless healthy hedonist mind began brainstorming Super Bowl ideas, specifically slow cooker chili recipes, this cherished victory came to mind, and I knew what I had to do. Forget about the lamb, the turkey, the chicken. The star of the show would be lentils, baby, followed by so many muffled man screams of delight. As an appliance wuss, it took me a while to warm up to my Crockpot (inherited from my ultra-domestic domestic partner, Charlie, during project cohabitation last February). This winter though, I’ve been crushing soups, stews and bone broths in it (with a lot of help from the new SkinnyTaste Fast and Slow Cookbook). 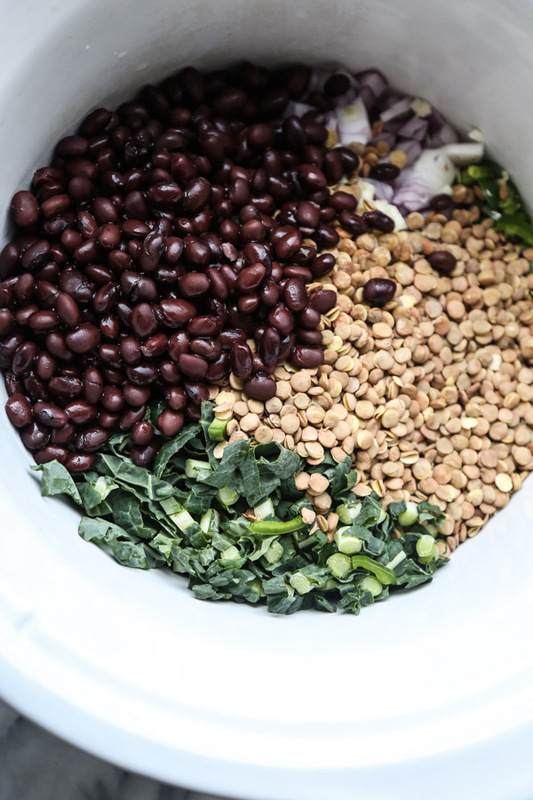 As soon as we got back from the holidays (pre-elimination diet), I was craving hearty, protein-rich pulses. 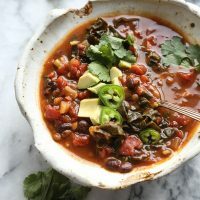 All the ingredients for this lentil chili recipe, except for the kale, were sitting in my pantry already. So into the slow cooker they went, along with a can of pumpkin puree to thicken the chili and add even more nutrients. Unfortunately, Keith lives in San Francisco now. And sadly I’m old, so having any more than 8 people in my apartment at once gives me mild anxiety. Instead of feeding the masses, I brought over some extra portions of this chili to my old cube-mate, Molly, who just had a baby. She was the person sitting at the desk next to me as I penned that first chili post, and most likely its second reader (behind my mom). 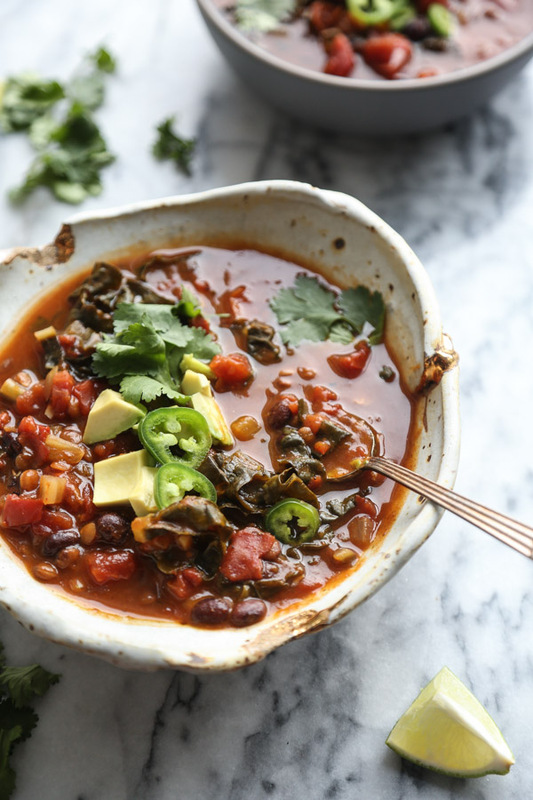 I’ll take her husband’s roaring approval as evidence that this slow cooker lentil chili recipe is just as competition worthy as its last veggie incarnation. So if you’re hosting a crew for the big game, consider adding this to the mix. I promise you just might find planty love in a hopeless, male-dominated place. 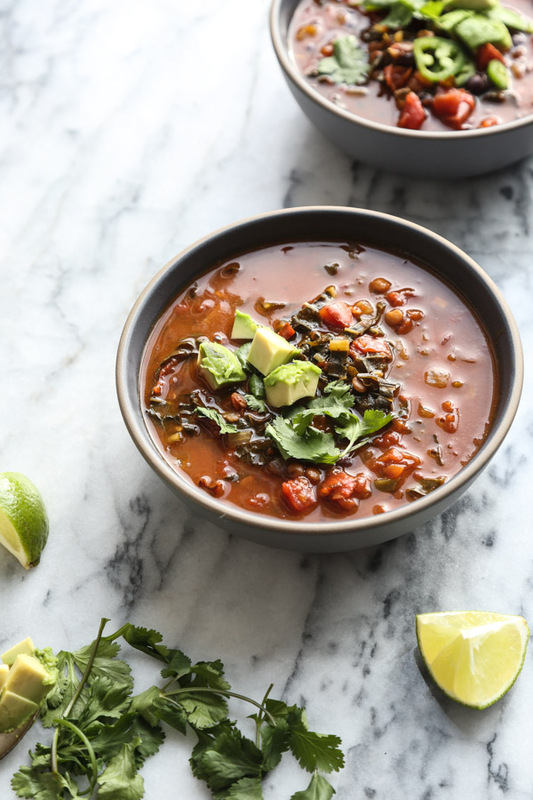 This slow cooker lentil chili recipe is an easy vegetarian dinner to throw in your crockpot. 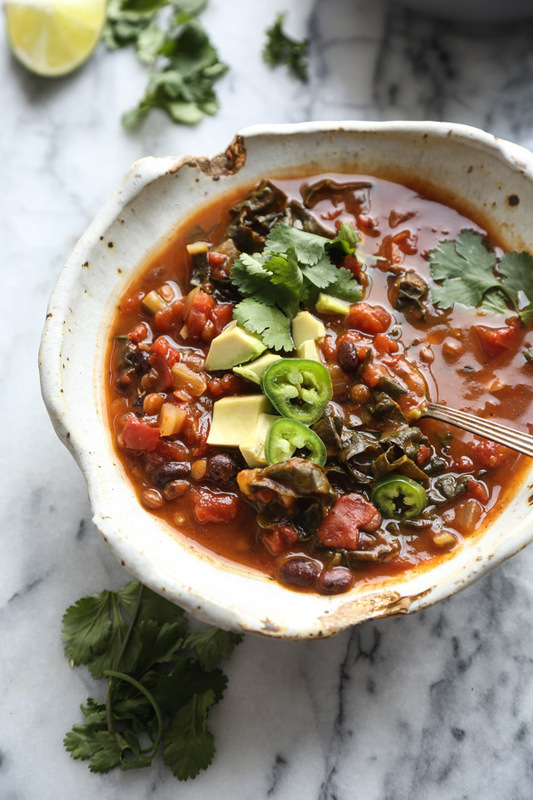 It's packed with super foods and protein--kale, pumpkin and black beans! Some healthy topping suggestions: fresh cilantro leaves, diced avocado, sliced jalapeno, diced red onion, Greek yogurt, chipotle cashew crema, shredded cheese. 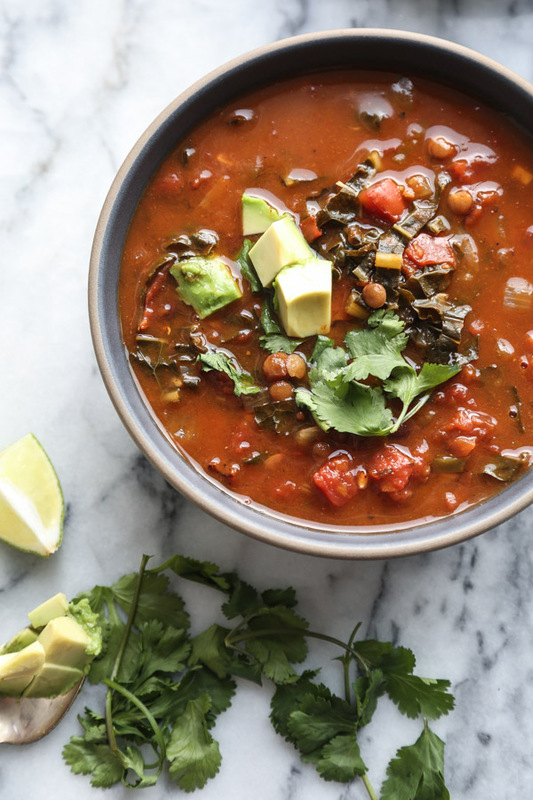 In a 6 to 8 quart slow cooker, combine the red onion, garlic, chili powder, cumin, paprika, sea salt, diced tomatoes, lentils, black beans, pumpkin puree, kale, and water or stock. Cook for 6 hours on low heat, or until the lentils are tender. Serve the chili with the lime wedges and any other toppings you desire (see suggestions above). Stovetop instructions: in a large stockpot or Dutch oven, heat 1 tablespoon of olive oil. Sauté the onion over medium-high heat until soft, about 5 minutes. Add the garlic, chili powder, cumin, paprika and salt. Cook one minute more, until fragrant. Stir in the tomatoes, scrapping up any brown bits that may have formed on the bottom of the pan. Simmer, stirring occasionally, until slightly reduced, 5 minutes. Add the lentils, beans, pumpkin puree, kale, and stock or water. Bring to a boil, reduce the heat to medium low, and cook uncovered until the lentils are tender and the chili is thick, about 30 minutes. I always had trouble digesting legumes without later gaseous reports – all except lentils. So this recipe is ultra ultra good news for me. Love the pictures and your ideas, but the pale gray writing is almost impossible to see and makes one not want to bother to read on. 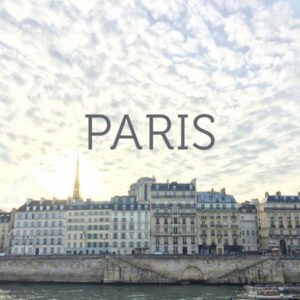 Unfortunately, it’s exhausting to read through one of the blogs. Hi Phoebe! 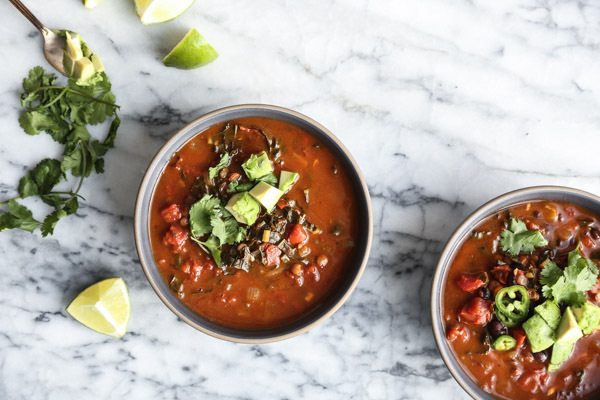 What did you put on top of the chili…I see avocados and cilantro in the pictures, anything else? I made this last night in my instant pot (because I seem incapable of remembering to put something in a crockpot even though I work from home). Really enjoyed it! I liked the body the pumpkin added to the soup, though I wished I could taste it more (though maybe today I will be able to– I’m on team-“soup is better the next day.”) Thanks! awesome Carly! Yes – the pumpkin is more for nutrition bonus points and texture than flavor. It’s really subtle and covered up by the tomatoes and spices. You can try my Thai pumpkin curry if you want something where the pumpkin is more of the star of the show! hope you enjoy it today regardless. thanks for making! Hi Phoebe! Your chili is so good we’re having it for lunch today! 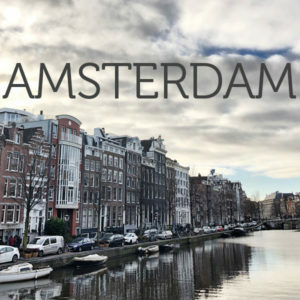 We’ve already made it once and I couldn’t get enough of it! that’s amazing Sunie!! so glad! Do you think you can substitute the pumpkin with sweet potato? definitely! just buy the puree so you get that thickness, though of course chopped sweet potato will taste great too.